Tim Fulford, Professor of English at De Montfort University, is one of the hardest-working scholars in Romantic studies. In the past several years, he has, among other things, edited (with Lynda Pratt) Robert Southey’s Later Poetical Works and large parts of his voluminous Collected Letters; produced editions of Robert Bloomfield’s letters and his poem The Banks of the Wye; and organised a series of excellent conferences. 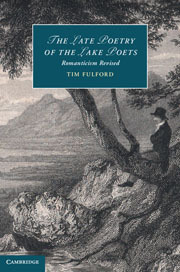 Below, we discuss his fascinating new monograph, The Late Poetry of the Lake Poets: Romanticism Revisited, which was published by Cambridge University Press last month. 1) In his last book, On Late Style, Edward Said looks at lateness not as ‘harmony and resolution’ but as ‘intransigence, difficulty, and unresolved contradiction’ involving ‘above all, a sort of deliberately unproductive productiveness, going against…’. Was a ‘contradictory, alienated relationship’ with ‘the established social order’ something you found manifested in the late works of the Lakers, or were their late styles more conciliatory? None of the above I think…Certainly not harmony and resolution, but not intransigence and going against an established order either. I see the Lakers as part of a contest for cultural authority; responding to the severe critiques made of them—personal attacks as well as reviews of their work—they revised old work, and produced new kinds of work, so as to gain legitimacy, influence and popularity. Their late careers did not so much feature self-satisfied summings-up, looking only backwards into their own oeuvres, as interventions in a vexed cultural sphere: they changed their style—and genre—; they revised past poetry, to win a public for work that had been widely derided for many years. 2) You argue persuasively that Wordsworth and Coleridge’s late works became neglected in part due to struggles in the universities in the early twentieth century to define a teachable method for literary criticism. How do you think our scholarly and pedagogical agendas need to shift in order to reintegrate these works? I think it’s not so much a change of agenda we need—the New Historicist methodology to which most Romanticists are committed has expanded the traditional canon and taught us to investigate writing in historical context; what we haven’t done, by and large, is follow-through by investigating the later careers and contexts of these poets. Much more work needs to be done on their writing, and its effect, in the 1820s, 30s and 40s. 3) How has your recent editorial work on Southey’s Collected Letters and Later Poetical Works informed this project? Southey’s letters are so full of references to contemporary events—political and cultural—and to history, that, annotating them, I learnt far more than I’d ever known about the period, and the positions of the Romantic poets in the culture of the time. Editing the Later Poetical Works showed me in detail what a variety of interesting poems Southey had written late in his career—and reminded me how little studied they are. It also showed how involved in revision he was—it wasn’t only Wordsworth that obsessively reworked poems to make an impact of a different kind when republished later in life. 4) In your introduction, you state that part of your purpose is to ‘investigate these poems for what they say to us now’. Could you pick out two or three examples from among these late works that you think have particularly strong resonances for modern audiences, general or scholarly? Wordsworth’s sonnet ‘Long Meg and her daughters’ is a quietly astonishing poem looking at a prehistoric stone circle and pondering our relationship to history; Coleridge’s composite prose/verse text ‘The Blossoming of the Solitary Date Tree’ is a post-modernist tour de force—a self-referential riddle exploring writing, creativity and sexuality. Southey’s A Tale of Paraguay is a salutary story about the dangers of well-meaning interventions in indigenous cultures—highly relevant in today’s world of ‘missions’ in Afghanistan and exploitation of the Amazon. I’m getting the 2014 Coleridge Summer Conference together, and finishing another monograph—provisionally called The Consequences of Love—on Romantic poetry emerging from, and redefining, partnerships and their breakdown. It looks at Southey, Coleridge and Mary Robinson as a collaborative circle, at Southey and Coleridge’s intense friendship and rivalry, at Wordsworth partnered by the ghost of Cowper in 1804, at Bloomfield and the Cockney essayists, at Wordsworth and Dorothy in the 1820s, and at Clare impersonating other poets in the 1840s. I’m also editing Part V of Southey’s letters, due out on the Romantic Circles website in 2015, and Humphry Davy’s letters, due out with Oxford in 2018. Saturday 8th March 2014: 10.00 a.m. – 4.00 p.m.
‘1814: A Bad Year for the Novel’? Five Questions returns in style with an interview with Dr Kerri Andrews, Lecturer in English at the University of Strathclyde. Hailed by Tim Fulford as ‘the doyen of Yearsley Studies’, Kerri is also interested in the broad sweep of eighteenth- and early nineteenth-century literary culture, and has published on Robert Southey, Charlotte Smith, William Cowper and William Wordsworth, among others. In this interview, though, we keep the focus on Kerri’s work on Yearsley, discussing her recently-published monograph, Ann Yearsley and Hannah More, Patronage and Poetry: the Story of a Literary Relationship and her new three-volume edition of The Collected Works of Ann Yearsley, published this month by Pickering & Chatto. 1) How did you first become interested in Ann Yearsley? I was right at the start of my PhD: I knew I wanted to write about women writers and how they accessed print culture, but I didn’t know which women writers I wanted to work on. I was browsing in the Special Collections at the Brotherton Library in Leeds when I came across a pamphlet in which was included ‘Mrs. Yearsley’s Narrative’, which I would later learn was affixed by Yearsley to the fourth edition of her first volume of poems. I read it having no idea who Yearsley was, but was immediately struck by the forceful language she was using – I had had no idea women could or did write like that in the eighteenth century. It really challenged what I thought I knew about the period, and I was hooked. Years later when I first met Tim Burke (who edited a selection of Yearsley’s poems for an excellent book published by Cyder Press) it transpired that we had both had the same first encounter with Yearsley, in the same place (he too did his PhD at Leeds), and that it had a profound effect on us both. 2) How did the new archival evidence you uncovered while researching Ann Yearsley and Hannah More, Patronage and Poetry lead you to reconsider their dispute and their places in wider literary networks? I think the biggest thing was discovering the letter from Yearsley to More, dated 13 September 1785. In that Yearsley makes a wholehearted acknowledgement of More’s goodness to her, but goes on to accuse her former patron of fraud. This made me realise that Yearsley had attempted to deal with the dispute privately and properly – she wasn’t some bitter harridan, which is sometimes the image we have of her, especially from older scholarship – but had tried to use all channels before resorting to the publication of her ‘Narrative’. But there was also something familiar about the letter when I first found of it (which initially made me panic in case I hadn’t ‘discovered’ it at all). I quickly found where I had read parts of it before: More had transcribed it for Elizabeth Montagu, and that letter had survived in the Huntington Library and had been republished by Mary Waldron in her biography of Yearsley. When I put the two letters together I realised that More had substantially, and very carefully, edited and rewritten Yearsley’s letter so instead of being about how her children’s inheritance was not being protected, it became about how Yearsley wanted the money for herself. That indicated some really interesting things about the way More was making use of her literary networks and her powers as a patron. More broadly, though, the new archival material indicated that Yearsley’s circle of acquaintances was much wider than we had known. And, of course, I found tantalising hints that Yearsley knew some of the most prominent Bristol radicals of the day, including Thomas Beddoes, and was associated with Cottle’s literary circle. The evidence I found isn’t enough to conclude that Yearsley was part of the inner circle which met above Cottle’s bookshop, but it was suggestive that she was at least connected to some groups of people who hadn’t before been considered part of her social context. That will open up new possibilities, I think, in reading Yearsley (or at least I hope it will). 3) What were the main pleasures and challenges of preparing the Collected Works? Perhaps the main challenge was the sheer size of the task! It was one of those ideas that seemed a really good one at the time, and I had set a five-year deadline so I was able to tick along pleasantly with it for a while, but when it came to really get down to it late in 2012 I realised just how much I’d taken on. Deciding how to organise the poetry was also tricky, as the early volumes especially come with so much crucial prefatory material. There were several iterations, but I think the current layout (with that prefatory material contained in Appendices, but not in the main body of the edition) is a good compromise. The main pleasure was finding so much new material, and I was particularly pleased that – just through happenstance – the first volume opens with two previously unknown poems. Others are scattered throughout the volume, but it was very nice to be able to present some of that very interesting new material right at the beginning. It was also a pleasure to produce an accessible edition of Yearsley’s novel, though I’m left with a great deal of knowledge about the reign of Louis XIII I’m not sure I’ll use again. 4) In the introduction to your monograph, you contend that the critical focus on the More dispute has ‘diminish[ed] the significance of Yearsley’s literary achievements’ and ‘shorten[ed] our critical focus on her literary career to the eighteen months during which she was More’s protégée’. With that in mind, which of Yearsley’s works do you think make the best entry points for those wanting to find out about her wider oeuvre and for those considering adding her works to modules and syllabi? My two personal favourite poems are ‘Clifton Hill’ and the second ‘Soliloquy’ poem. Neither has any relation to the image of Yearsley as combative; they showcase instead her ability to closely observe and identify with a landscape, and her serious philosophical interests. Indeed, one of the things that I discovered working across the edition was the frequency with which Yearsley engages with Classical philosophy. References to philosophy abound in her novel, but there are also references to Platonism in her letters, and philosophical ideas become increasingly important in her later poetry. I think these are the sorts of things that get overlooked by critics focused on the juicy bits from 1785, and might help make Yearsley more than the go-to labouring-class poet on survey courses. 5) What’re you planning next? Next is a turn to the dark side, and some work on Hannah More. It became apparent as I was working on the monograph that scholarship badly needs an edition of More’s letters, so I’ve put together a team to produce an electronic searchable edition. We’ve just been knocked back by the AHRC, though, so we’re back to the drawing board in terms of securing funding, but I’m very hopeful we’ll be able to convince someone to support the project. At the same time I’ve also started working on the second monograph which is going to be (at least it is at the moment…) on newspaper culture in the late eighteenth century. I discovered that Yearsley published in the papers from 1787-94 (another new aspect of her career for scholars to pursue I hope), and I’m intrigued by the role the papers played in the literary culture of the period. It’s very much in the early stages, though.